Before I get started, here is my only CON for this toy. These bears are a relatively good size and really hard, so they don’t scream “Put me in your mouth!” But, as all mothers know, this means nada. So…while they are awesome, this is a toy that requires some observation on the parent’s part. This is not the toy to busy your kid with while you hop in the shower or run the vacuum. 1. What color is this? I have them identify the color and then place the bear in its matching cup. 2. Here are 3 bears (different colors). I have them identify each color and count them back to me as they place it in its matching cup. 3. Pick a “red” bear and give it to Mommy. I line up all of the bears (or even dump them in a big pile) and give them a color to pick out and give to me. This can be taken up a notch for more advanced kiddos, by asking them to give you a certain number of bears of certain colors. 4. Count our colors. 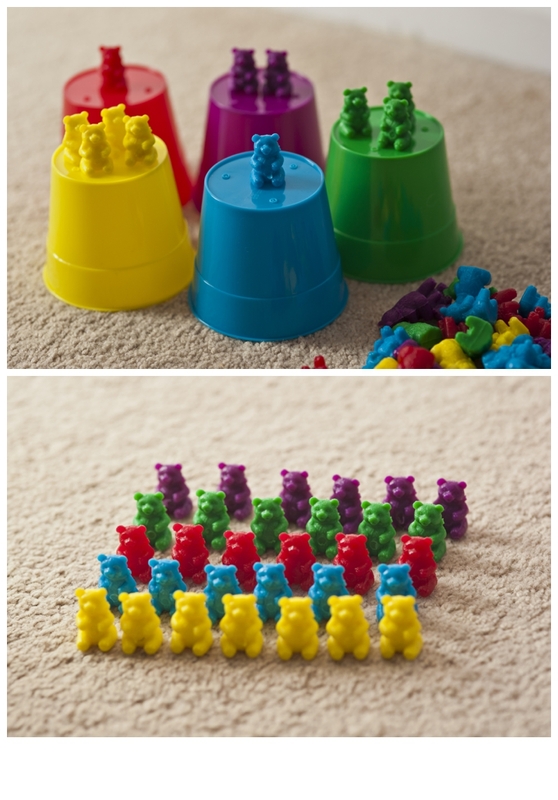 We separate the bears into piles of their colors and then count them together back into the cups. 5. Clean up the bears. Seriously, they love this one. It’s like 52 pick up with animals instead of cards. 6. Line up your colors. Everybody loves to build a mini army of color-coordinated bear squadrons. 7. Stack and unstack the cups. Tower! When the bears get old, I swap to the cups. Some simple towers always bring a smile. 8. Flip cups – Bears on top. Instead of lining up the bears or grouping them in piles, we switch it up by using the upside down cups as platforms for whatever game we are playing. 9. Color patterns – What’s next? I set up simple patterns and ask them to pick the bear that fits next. 10. Give me “7” bears and count. I give them a number of bears that I want and they get to pick what colors they give back to get to that number. One final twist that they love…turn the tables! They’re in control and get to ask me the questions. They LOVE to ask “Mommy, what’s this?” or order me to “give them a red bear.” Let them play teacher for a bit and you’ll keep them busy for hours! Cute! My kids would love that! Thanks for sharing with the Merry Monday Linky Party! suggest a good hosting provider at a fair price? Thank you, I appreciate it!